I must have been insane when I bought a copy of Nero 8 almost a year ago. Perhaps my judgement was clouded by tales of Nero being the ultimate tool for working with CD & DVD media. How I wish I had saved myself some money and just looked for an open source application then. I really just use Nero Express most of the time to burn discs as well as Nero ImageDrive to manage virtual drives that I use to load ISO images from my hard drives. I have tried on occasion to look into some of the other applications but the user interfaces are over-complicated and the documentation is frankly shocking; so I never got very far. The one thing that I have tried to do a few times, today being the latest; and which has prompted this rant is to copy a data DVD to an ISO file that I can later mount with the aforementioned ImageDrive. 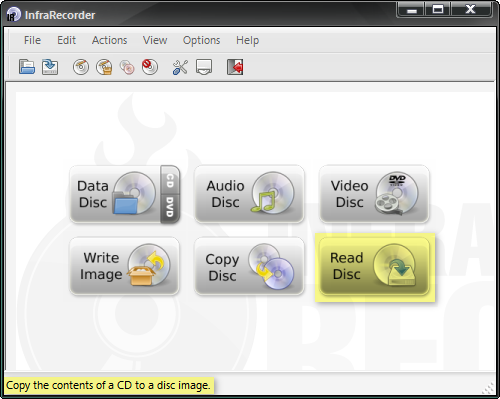 Having previously used applications like Magic ISO Maker I would expect this to be a simple operation involving just a click or two and the selection of a file to save the disc image to, but no; Nero makes this so complicated that each occasion I have had a need to do it has prompted a session of searching for help with Google, only to end in frustration and the use of some other piece of software. In this latest episode I recalled that LifeHacker covered the Five Best CD and DVD Burning Tools recently in their Hive Five series. I grabbed a copy of the portable version of the top pick, InfraRecorder and had it up and running after a simple unzip; portable applications are great. Lo and behold, there was the very thing I expected, a simple button that opens a dialogue, asks you to select the source and the destination, then gets on with the job without further ado. So, as far as I’m concerned Nero AG might as well strike me off their mailing list right now; they’re just wasting electrons by sending me e-mails suggesting I shell out more money for Nero 9, which is probably even more bloated and complex than Nero 8 is. Click here to view a larger version or on the image above to visit the Flickr page. I don’t own, and can’t afford to buy, one of the latest versions of Photoshop that have good panorama stitching support; or a specialised stitching application for that matter. I must therefore resort to free applications and have had good results from Autostitch up to this point. This panorama is the first one that I was not able to stitch successfully with it; the result had many artifacts and stitch errors and it would not really have been practical to try and repair them to reach a usable image. I tried the new Microsoft ICE and it did a reasonably good job, with just two stitch errors that were easily corrected. However it produced very marked colour banding with this image so I had to try something else. 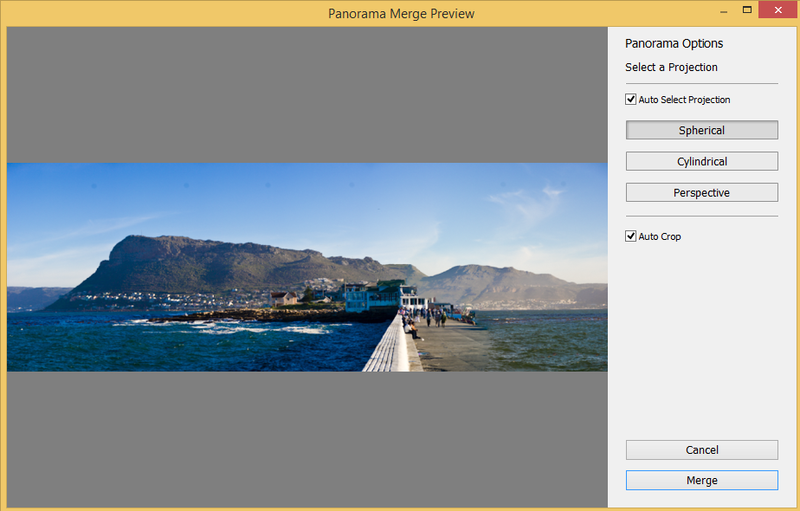 I have heard of Panorama Tools but been put off by their non-graphical nature; they seem as though they would take some major effort to learn and use. 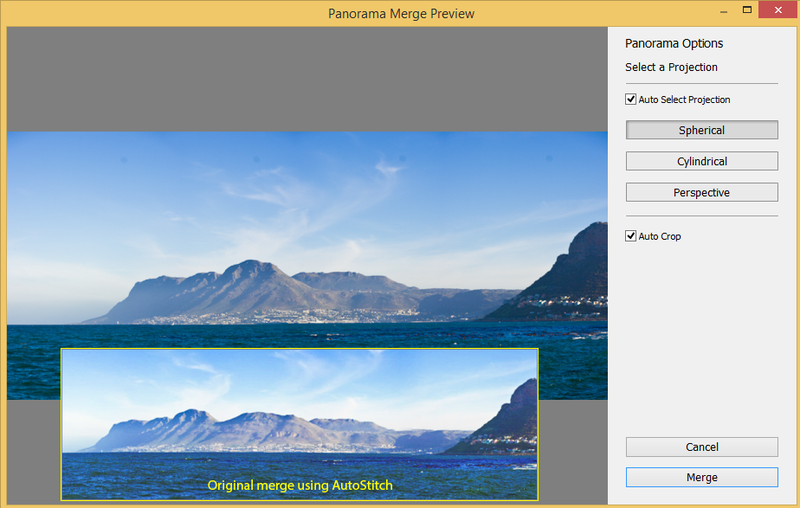 The Panorama Tools page mentions hugin, a graphical frontend, or toolchain, that uses Panorama Tools behind the scenes. I hoped it would hide some of the complexity so I gave it a try with this image and was blown away. Performing just an automatic stitch, using the wizard, without needing to delve into all the options, produced this image with no stitch errors that I could see and no colour banding. hugin will certainly be my choice of panorama stitcher from now on.